Which stock is a better bet on ubiquitous internet connectivity? Arista Networks (NYSE:ANET) and Sierra Wireless (NASDAQ:SWIR) both offer investors unique ways to profit from the growth of the Internet of Things (IoT), which connects various devices to one another and the internet. The global IoT market could grow from $235 billion in 2017 to $520 billion in 2021, according to Bain & Company, fueled by improving internet connections worldwide. Arista sells networking switches that are optimized for software-defined networking (SDN) solutions in the cloud, where its open-source EOS platform does the heavy lifting. Sierra is the world's largest maker of wireless embedded modules and gateways, which are widely used in machine-to-machine (M2M) communications. Demand for these technologies should continue rising as the IoT market expands. However, shares of Arista and Sierra fell about 3% and 30%, respectively, this year -- due to concerns about growth, cyclical headwinds, tariffs, and a downturn across the broader markets. Should investors buy either stock at these levels or wait for lower prices? Arista usually generates stronger sales growth than Sierra, but its growth has been decelerating. Year-over-year revenue growth by quarter. Data source: Quarterly reports. Sales growth stabilized last quarter, but that was partly attributed to its acquisitions of cloud Wi-Fi provider Mojo Networks and low latency platform provider Metamako. It also launched new 400-gigabit fixed switches during the quarter -- and it expects demand for those new switches to ramp up throughout 2019 as campus and enterprise customers upgrade their networks. Arista expects its revenue to rise 24%-27% during the fourth quarter. Analyst forecasts call for a jump of 30% this year and 23% next year. Sierra's growth also accelerated earlier this year, but much of that growth can be associated with its purchase of M2M enterprise solutions provider Numerex last December. However, that boost won't last much longer. Sierra expects its revenue to go up just 9%-13% during the fourth quarter. Wall Street anticipates a 15% rise this year but just 7% next year. Which company has superior margins and earnings growth? ANET Gross Profit Margin (TTM) data by YCharts. Sierra faces less competition as the market leader in the M2M modules market, as Arista remains an underdog in the network switching market -- which is dominated by much larger companies like Cisco (NASDAQ:CSCO) and Huawei. However, Arista's cheaper switches and cloud-based OS give it a disruptive edge against those market leaders, which mostly sell their hardware products in pricier proprietary bundles. 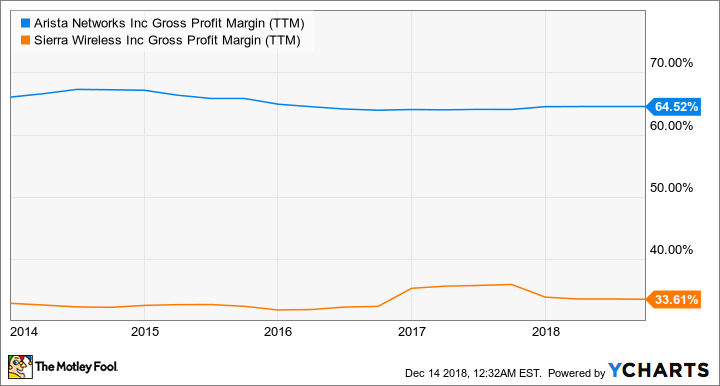 Last quarter, non-GAAP gross margin rose 20 basis points annually to 64.6%, and Arista predicts that figure will stay between 63%-65% for the fourth quarter. As for tariffs, the impact should stay "somewhat muted," according to the company, as it ships pre-tariff finished goods and passes some of the costs onto its customers. Analysts expect a 21% earnings boost during the quarter and 38% for the full year. Sierra's non-GAAP gross margin fell 20 basis points annually to 33.1% last quarter, and it didn't provide any margin guidance for the fourth quarter. However, it said that the tariffs would reduce its fourth-quarter EPS by $0.03, implying a 21% drop to 7% growth from a year ago. Analysts expect a 13% earnings dip for the full year, but Sierra's exposure to tariffs should decline as it shifts some of its production from China to Vietnam. Arista is growing faster than Sierra, and its stock isn't too expensive at 26 times forward earnings. Sierra's stock is cheaper at 16 times next year's earnings, but it's generating weaker growth and is more exposed to rising tariffs. Therefore, Arista Networks is clearly the better long-term IoT investment at these prices.